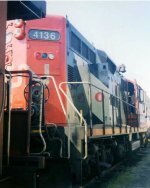 Album Info: Photos of CN engines from across Canada. Description: CN 1384 at the train station in Kitchener, Ont. Having seen many years of service, her paint is slowly revealing the previous green and gold colors from earlier years. Description: Front view, with the old green paint showing through. Description: CN 1384 sits on the tracks at the Kitchener passenger station with her caboose. Description: Desperately in need of some maintenance. Description: CN 9638 and CN 9509 head up a long intermodal train going through the Belleville yard in 1992. Description: Left side view of CN 1254 on the siding at Kitchener station. Description: CN 1254 sit beside caboose CN 78132 on a siding at the Kitchener station. Description: Pulling the Algoma Scenic train from Sault Ste Marie this engine is now waiting for the tourist to return from exploring the valley. Description: This 2-8-0 steam engine now sits at Memory Junction Railroad museum in Brighton, Ontario after being moved from a park in Belleville, Ont. Description: This engine was moved 20 km from a park in Belleville and it now rests at Brighton, Ont. along the CN and CP main lines. Description: At the Winnipeg, MB yards. Description: Long freight passing through Winnipeg. Description: This engine is in the Winnipeg Engine Facility and was retired from service in 2010. The photo is a little blurry and was taken from a very long distance, but the details are still clear.